Please consider my, recent, query on "Günther Mannheim" who was Heinrich Mannheim's son, down at this page. Notice also: Düsseldorf-Aachen talk 2006 (PDF-ppt)! The objective of this publication is to recall some aspects of the course of history with respect to early radar developments. It was on the 9 June 1904, just a hundred years ago, that the twenty-two-year-old Christian Hülsmeyer demonstrated his radar-like apparatus on board the ships-tender Columbus in the harbour of Rotterdam. His audience was, in the first place, the technical representatives of the main Atlantic shipping companies which at that time were from Holland, Britain, France and Germany. The demonstration was arranged to take place during a Nautical Conference, which was hosted by the Holland-Amerika-Lijn (HAL) shipping company. The conference chairman was Mr Wierdsma, the CEO of that shipping company, whom, by his personal involvement, made it possible for Hülsmeyer to demonstrate his Anti-ship-colliding system to an international gathering of shipping experts. 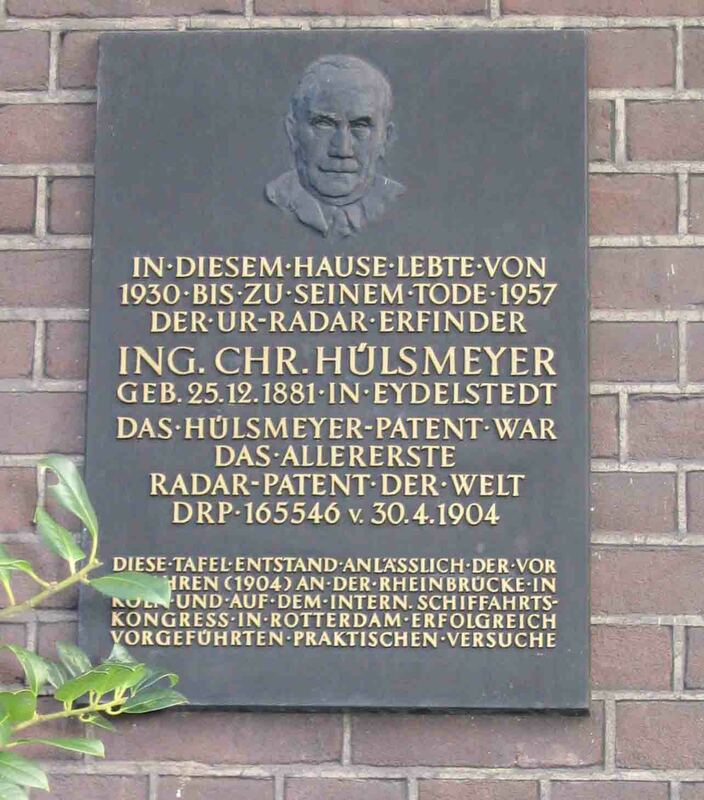 We will also look briefly at Hülsmeyer's inventions and the commercial implications. Heinrich Mannheim. Notice also my: Düsseldorf-Aachen talk 2006 (PDF-ppt), with additional findings in 2006. It was believed until recently, that Hülsmeyer's revolutionary Telemobiloskop apparatus came too early, as technology could not yet cope with the very technical difficulties. This may well be true though, recent discoveries in a Dutch archive, allow us to get an unprecedented inside view as to what the circumstances were in those days. To understand the course of this brief story, we have to start in 1864 with Maxwell's famous theoretical equations and consider its scientific proof, between 1884 and 1888, by Heinrich Hertz. Those whose commitment made this publication possible, met in Düsseldorf on 29 January 2005 in Hülsmeyer's house (both photographs taken in front of it). 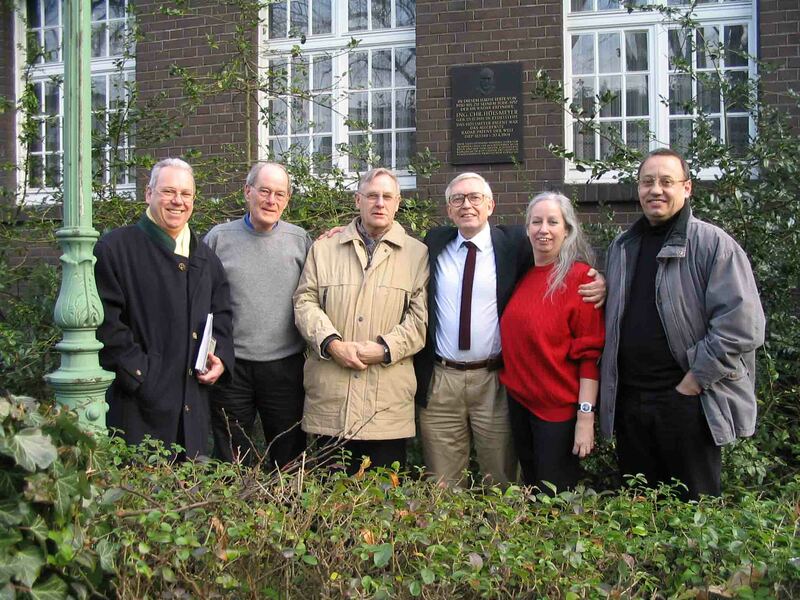 From left to right: Bernd Hülsmeyer, Adri de Keijzer, Reinhold Liebich, Arthur O. Bauer, Karin Hecker and Reinhard Dellenbusch. (numbers 1, 4 and 5, are Hülsmeyer's family members). Query on the whereabouts of relatives of "Günther Mannheim", whose father was Christian Hülsmeyer's business partner Heinrich Mannheim of Cologne, during late 1903 up to late 1905.